One of the most immediately striking features of the area is the spectacular ruin of Carrigogunnell Castle, situated just 3 km north of Clarina Village. The history of Carrigogunnell and the O’Brien’s of Pubblebrian has been fairly well documented, but any account of Ballybrown and surrounding town lands would be incomplete without some reference to what was such an important stronghold of the O’Brien’s. In 1209 A.D. King John granted Carrigogunnell to Donchad Cairbreach O’Brien, at a yearly rent: of 60 marks, or about £40. The property was conferred on O’Brien in recognition of the fact that he had already paid homage to the King. The same King John also granted land to the De Burgo family. They got some in Castleconnell, and also had land in the Ballybrown area, in what was known as “Esclon” which included the large town land of Newtown. By the mid-fifteenth century De Burgos land in Esclon had come under the control of the Earl of Desmond, and in 1449 Desmond conferred the land on Brian Duv O’Brien of Carrigogunnell. Brian Duv was succeeded by his son Donough who died in 1502, and; was succeeded by his son Mahon or Mahowne. Carrigogunnell Castle appears to have been built by Brian Duv, in or about 1449, and while it may have been built on the site of an earlier structure, there appears to be no evidence of its existence when the O’Brien’s first got the grant of Carrigogunnell in 1209. In 1536 Lord Leonard Grey, Lord Deputy of Ireland in the reign of Henry VIII, captured Carrigogunnell and dispossessed Mahowne. The Mayor of Limerick at the time was a man named Edmond Sexton, and he appealed to Grey to restore to the O’Brien’s another Castle which had been captured at the same time as Carrigogunnell. Grey agreed to do so, but when the order restoring the other Castle reached Mahowne he took it to Carrigogunnell, and the Garrison surrendered the Castle to him. On hearing of the deception Lord Grey immediately attacked the Castle. His Army broke down the front door at the south of the building, and forced the Garrison to surrender. They were taken to Limerick, tried, and executed. The Castle was later returned to the O’Brien’s, and in 1539, we find Donough O’Brien, Mahowne’s son, being forced to surrender the Castle after he and his Garrison had been found guilty of plundering the surrounding area, and terrifying the Mayor and citizens of Limerick. He was not the only Lord of Carrigogunnell to engage in criminal activity. His predecessor Mahowne was found guilty of extorting a tax on wine from Dominick White, a Limerick Merchant, and in 1642, David Roche of Limerick complained that another Donough O’Brien of Carrigogunnell, stole some of his stock, including cattle, horses, sheep, and swine, household stuff, and implements of husbandry, causing loss and damage to the amount of £746. A second Brian Duv O’Brien, while Lord of Carrigogunnell, made a formal surrender of his lands to Queen Elizabeth in 1584, and got a re-grant from her of almost all Pubblebrian. He died in 1615 AD. Brian Duff was succeeded by his only son Donough, who died in 1632 AD., without issue. His widow married Edmond, Lord of Castleconnell. In the early 1640’s, there was another Donough O’Brien of Carrigogunnell. He supported the Confederates in opposition to Cromwell. The Castle was surrendered to Cromwell’s forces in 1651. After the surrender a Captain Wilson held Carrigogunnell, and in 1655 Sir Hardress Waller was listed as the owner. The tenancy of the castle was, however, in the name of the then Archbishop of Dublin, one Michael Boyle. His tenancy was renewed for sixty years by lease dated, 7 th . March 1660. John Caper was his sub-tenant, as the Archbishop did not reside in the castle. Boyle was the owner for many years, and at one stage a man named Merigath O’Brien held it as his sub-tenant. 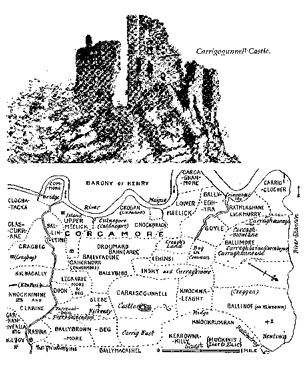 Carrigogunnell Castle was destroyed in 1691 after the second siege of Limerick, and in about 1692 Thomas Monsell purchased the lands of Carrigogunnell, from Archbishop Boyle. During the period of the second siege of Limerick, 1690/91 an English man named John Stephens, who supported James II against William of Orange, was in occupation of Carrigogunnell with a garrison of 150 men. They were in “Free Quarters” among the inhabitants of the adjacent district prior to the siege. Stephens found the people kind and hospitable. They supplied meat, barley bread, milk and butter, but no drink. The poor ate potatoes with sour milk, and a little bread. All the people, including the women, smoked a pipe about one inch long. The same pipe served all the family, and would be passed round from person to person. The people also took snuff. The garrison took no part in the actual siege, and surrendered without a fight to the Williamites. The English did not need the Castle as a garrison, so they destroyed it, using a very large quantity of gun powder. The actual blowing up of the building took place in September 1691. James Storey, the historian of the Williamite campaign was appointed Dean of Saint Mary’s Cathedral by William III. He was also paid the sum of one hundred and sixty pounds for buying gun powder to blow up Carrigogunnell and Castleconnell Castles. At the north east angle of the outer Ward of Carrigogunnell there is, to this day, the remains of a large oblong house. Mr. Westropp, the historian, states that in 1873 or 1874 he was told that it was the remains of the castle chapel, but expresses the view that there is nothing in the ruin to support this theory. Many of the old people in the parish still claim however that the building was, in fact a Chapel. Mr. Westropp also refers to a small dungeon like cell, entered by a hole in the roof, which local people in his day, referred to as the Danes Prison, a place into which the Danes threw their prisoners before they, themselves were routed by Brian Boru, Westropp states, very clearly, that the cell was nothing more sinister than part of the castle drainage system. I have never heard of the Danes prison, but over 60 years ago it was known as the “Hanging Hole”, and a Mrs. Cosgrave, nee Kelsey, who was born in 1847, claimed to know the name of the last man to be hanged in Carrigogunnell. She was born and reared in Carrig Road, within 500 yards of the castle. The man was convicted and hanged for some minor theft. Carrigogunnell is now, and for several generations has been, a place where young people congregate. It is up to one hundred years ago since Father Peter O’Shea of Kildimo wrote his beautiful songs about Carrigogunnell. In one of the songs he refers to the music of the violin, and to young people gathering to “sport and play the live long day”. 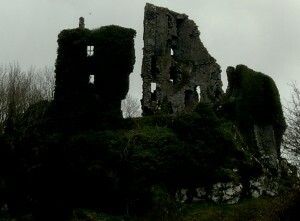 There is a record of a visit to Carrigogunnell by a man named Holmes and his friends, nearly one hundred years before Father O’Shea’s time, and to this day young people gather at the old ruin; It is now a favourite place for bonfires to celebrate local hurling or football victories, and as a camping place for Boy Scouts. The photograph of Carrigogunnell in this book shows an unusual view of the ruin, and hopefully it would have pleased Crofton Croker who wrote the following epigram about the castle.